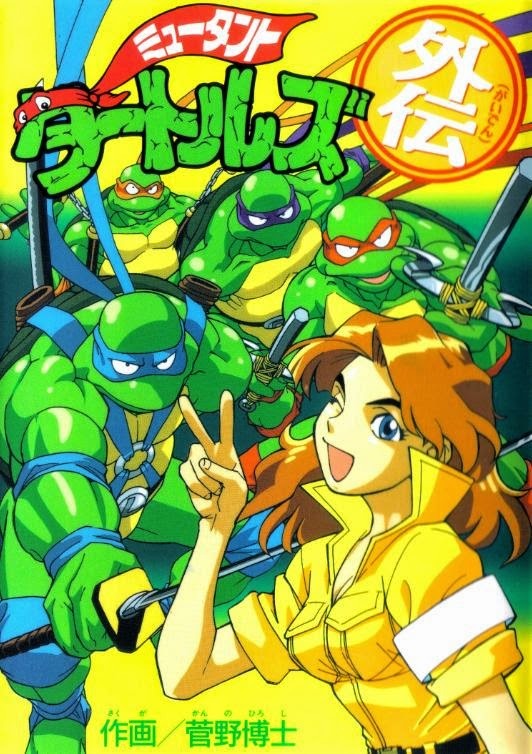 There have been a number of TMNT comics published in Japan which have never been released in the West. The majority of these comics are dull adaptations of episodes of the Fred Wolf cartoon, but a few graphic novels-worth of original content were published. The ability to read Japanese happens to be one of my many talents (disclaimer: It is my only talent), so I decided to make these comics available in English for the very first time. Credit where credit is due: All raw scans are provided by Adam Winters, owner of perhaps the largest TMNT manga collection in the Western hemisphere. All clean-up and text editing is provided by the talented folks at the Optical Internet Translation Gang, who excel at making hard to find international comics available to English readers. All of my translations are available in convenient .cbr files via the OITG website. Many of these comics are very hard to find, but we will make them available to you as soon as we can scan em, translate em and text edit em! Super Turtles Vol. 1: "Mystery of the Sacred Mutastones"
Super Turtles Vol. 2: "Adventure of the Micro Turtles"
Super Turtles Vol. 3: "Birth of the Silver Warrior: Turtle Saint!" Hi, I like a lot your work wih the TMNT manga. Excuse me, i have a question, will you work on the Yoshoika´s TMNT manga? The same with the Saint Turtle theme. I have scans of Yoshioka's TMNT story pages, though they're a bit tougher to translate because of the image quality (and I can't really photoshop the text over the images like I can in these comics). Maybe some time down the line. I do plan on doing the Super Mutant Turtle manga next, I just need to get ahold of Vol. 1 of the series, which continues to elude me. It's next in line, though! Great work bro! I look forward to more. This stuff is HOT! Look at April and Irma! MMmm mmm! Do you have anymore scans to translate? Super Mutant Turtles Volumes 1 and 2 are in hand, but I don't want to do them until I can get ahold of Volume 1. We've been trying, but thus far the only places they've popped up is Amazon Japan and most of the sellers refuse to ship internationally. Hey man, this is Nelson from the Technodrome. Thanks for translating and uploading this manga, I've always wanted to read it. I downloaded all the pages and united them in a cbz file for future re-reading. Because of Blogger's file size limits, I can only attach one image per post, at least so that they can still be enlarged to full size. Coupled with all the navigational hotlinking I have to do, just posting the manga pages is very time consuming. I'm afraid there just aren't enough hours in the day for me to post the Japanese raws along with the English translations. And Hidetsugu Yoshioka's Super Turtles and Metal Mutant Turtles story pages are some favorites of mine, as I'm a big fan of Yoshioka's (particularly his Transformers work). However, the only scans available online are too low quality for me to fully translate the pages. I could try and hunt down the back issues of Comic Bom Bom myself, but volumes from that era are expensive on the aftermarket due to the Transformers G-2 content making them highly saught after. If the opportunity presents itself, though, I'd love to get ahold of the physical copies. "The Sword of Tengu. The sword with which I laid villages to waste, brought castles to ground, vanquished armies. The sword that I used to conquer Japan, and give power to the Tokugawa clan. It is mine once more!" Ahhh. The quote from the 2k3 Shredder suddenly makes a lot more sense! Funny it was another TMNT story to educate me on the legend. I always wondered what he was talking about... looking up history on the Tokugawas didn't help much. Cool! Thanks for the fantastic seven volumes, I will enjoy reading them! The fight with the Shredder in the first one, despite its brevity and nothing-happenedness, is surprisingly well-staged with a vibrant sense of movement. I especially like his twisting arm position. I pretty much always love it when the Shredder does ANYTHING with his gauntlets.